Stephen A. Smith keeps it too real sometimes. 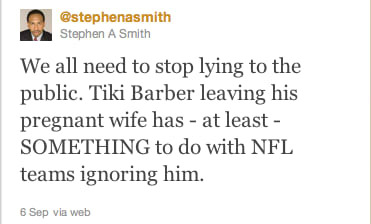 Tiki is clearly a douche bag of epic proportions, but we doubt the NFL is worried about "high character" guys. We think it's more about Barber being a 36 year old RB and did we mention he's a douche?